The S&P 500 Utilities Index has given up more than 10 percent of its value since early July—just the 18th time since World War II that the sector has posted a double-digit loss from top to bottom. 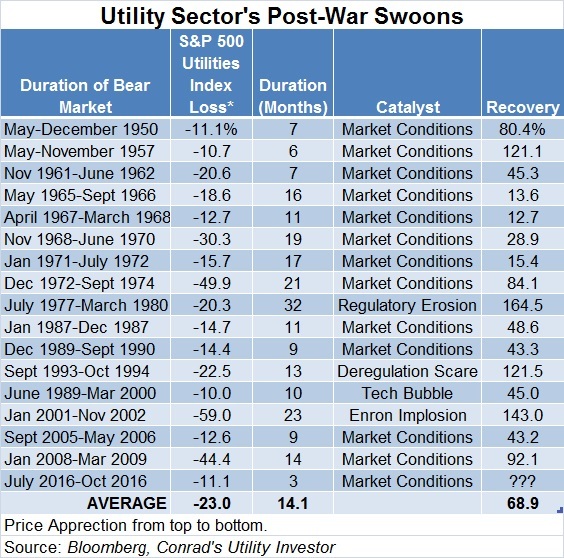 On average, the previous 17 corrections in “Utility Sector’s Post-War Swoons” ended after roughly 14 months and involved a decline of 23 percent, excluding dividends paid. If past is prologue, the current pullback may have another 10 percent or so of downside, barring any unforeseen catastrophes. Let’s delve into the proximate causes of some of these previous corrections and their implications for the current environment. The S&P 500 Utilities Index declined by about 11 percent from May to November 1957. In this instance, this modest pullback was followed by an explosive 121.4 percent gain over the next four years. Despite the difference in magnitude, both corrections started with utility stocks trading at unsustainably high valuations and few analysts calling for the good times to end. At these levels, the bar of expectations becomes increasingly difficult to meet, setting the stage for disappointment and giving investors an excuse to take profits. Back in 1957, the 11 percent correction had returned utility stocks to reasonable valuations. And with the US electrification boom in full swing, utility stocks generated an outsized return over the next four years. Six months into the 2001-02 meltdown, the S&P 500 Utilities Sector Index had given up about 11 percent of its value. But the sector’s underlying fundamentals were deteriorating at a rapid rate. California’s dysfunctional power market had spiraled out of control, triggering bankruptcies and huge spikes in the price of wholesale electricity. Enron was also in the midst of imploding, along with peers that had followed the former industry leader into energy marketing. By early 2003, two dozen utilities had declared bankruptcy or found themselves on the brink of insolvency. Even shares of high-quality names that opted not to do their best Enron impression sold off. Despite the pain associated with the 2001-02 meltdown in utility stocks, investors who held their positions in best-in-class utilities eventually recovered all their losses and much more—even if they owned an Enron or two. This catastrophe ushered in a new generation of management teams to the utility sector, and this group focused on paying down debt, reducing operating risk and repairing strained relations with regulators. As a result of these efforts, utilities find themselves in their best financial health and operating shape since the 1960s. Staying the course through the 2001-02 crisis required an incredible amount of fortitude and patience. Many investors compounded their losses by throwing good money at bad companies or selling too soon. One of my chief takeaways from this harrowing and humbling experience is that companies which provide an essential service eventually will recover their market value as long as the underlying business remains sound. Although not every stock I stuck with in my personal account and in my newsletter turned out to be a winner, my commitment to holding these stocks was vindicated in 2003, the first year of the sector’s recovery. These dark days also taught me that investors can fare even better in a meltdown by taking some profits off the table when valuations reach unsustainably high levels and pouncing on the buying opportunities that occur near the bottom. High-grading the portfolio by selling any names whose earnings, guidance and/or business developments raise questions about their ability to weather a challenging economic environment. Building a cash reserve to deploy during a correction by taking a partial profit on stocks that trade at unsustainably high valuations. Assembling a shopping list of high-quality names to buy on a pullback or by setting good-until-canceled limit orders at dream prices. This strategy is executed in the Capitalist Times Premium portfolios to protect investment downside and look for hidden upside. If you don’t already subscribe, do so now. Subscribers receive detailed analysis on all sectors and two full portfolios that adapt to uncertain and changing market conditions. With the Dow Jones US Utilities Index trading at more than 20 times earnings and yielding less than 3 percent, these historically elevated valuations suggest that the market had raised the bar of expectations to levels where investors would latch onto any excuse to take profits. In short, the risk-reward balance had shifted to the downside. Valuation alone won’t trigger a correction or a bear market; stocks can remain irrational far longer than many investors can remain solvent. A catalyst must emerge to trigger the selloff. In July, valuations and expectations had reached levels where the number of potential downside catalysts dramatically outweighed the upside catalysts. Our strategy has worked thus far, with utility stocks selling off from prices where we considered taking profits on individual Portfolio holdings. ProShares UltraShort Utilities has also gained more than 18 percent since early July. The big question is whether this pullback in utility stocks shares more in common with the relatively mild pullback of 1957 or the catastrophic selloff that occurred in 2001 and 2002. At this stage, a meltdown akin to what happened in 2002-02 appears to the least likely outcome, in part because utilities appear to be in their best financial and operating health in decades. And a number of opportunities have emerged for these companies to accelerate earnings and dividend growth. Unlike the 1950s, growing demand for electricity won’t drive this investment cycle. The US Energy Information Administration forecasts relatively tepid growth in power consumption going forward. New sources of demand such as the emergence of electric vehicles and increased electrification of industrial processes will be offset by the adoption of rooftop solar power and improved energy efficiency. The spending boom underway in the utility sector will stem from a transformation in how the US generates, delivers and uses electricity. And unlike the surge of capital spending on new power plants in the 1960s and 1970s, the latest round of investments in grid efficiency, energy storage, renewable power, pipelines and gas-fired power plants will be recovered quickly. The risk of a wave of 1980s-style write-downs appears limited. Utilities haven’t forgotten the hard lessons of the 1980s, when state regulators refused to pass on cost overruns to rate payers, forcing companies to take billions of dollars’ worth of write-offs and slash dividends in an effort to avoid bankruptcy. Bottom Line: The recent correction in utility stocks has nothing to do with the sector’s underlying fundamentals, which appear to be as strong as ever. Subscribe to Capitalist Times Premium for access to specific investment strategies and portfolio details.